As Jim Chirico, President & CEO told the audience, “Avaya is delivering, and is focused on execution and accountability. We want to get back to basics, focus on simplicity and not boil the ocean. The company is transformed to a customer-led, customer-driven company.” For those of us who have been following Avaya for many years, it’s reassuring to hear about the focus on listening to customers, which hasn’t always been the case. Continuing investment in Avaya’s core business, including unified communications and contact center. Delivering new technologies to the market. Aimed at disrupting the status quo, Avaya has products in AI and mobility that are generating revenue, with significant growth rates. Delivering cloud with breadth and depth. For example, Avaya announced the new Avaya OneCloud ReadyNow Platform, focused on security, reliability, and scalability. Chirico also highlighted how Avaya is focusing on the convergence of unified communications and contact center, or UC+CC. This is an area I’ve been focusing on for years, and I’m glad to see Avaya taking advantage of its strength in both these areas to provide added value to customers. There were several announcements made, but the one that resonated the most with me was the new branding and naming conventions. With the theme of simplification, the new solution names are intended to make things easier for customers, although a bit confusing for analysts who have been following Avaya for years and now have to learn the new names. We heard several new names – including Avaya Intelligent Xperiences (IX) and OneCloud. AI is infused across all of these solutions. To help move more quickly in the AI space, the company created an Innovation Incubator organization headed by Laurent Philonenko, SVP, Innovation. As part of the new branding, many of Avaya’s traditional product names such as Equinox and Oceana are going away. For example, IX Omnichannel replaces Oceana, while IX Collaboration replaces Spaces. Again, the goal is simplification. In this video interview, Karen Hardy, Vice President, Product & Solutions Marketing, discusses the new announcements and the new branding, and sums up the key messages of the event. In this video interview, Mike Kuch, Sr. Director of UC Product Marketing talks about IX Digital Workplace and OneCloud, team collaboration, Avaya’s partnership with Slack, as well as Avaya’s Loyalty2gether program. Kuch also provides an excellent example of the convergence of UC and contact center, and how businesses can improve the customer experience by seamlessly transferring contact center customers to specialists outside of the contact center while maintaining the interaction and providing the specialist with the omnichannel and collaboration tools to best serve the customer. Another part of Avaya’s path to simplification is the new OneCloud. OneCloud is Avaya’s overall name for its cloud solutions, including public, private, and hybrid, as well as Avaya’s CPaaS offerings. Because of its large installed base of premises-based customers, Avaya needs to view the cloud differently than most other vendors. Avaya understands that for a good portion of its base, a private cloud or hybrid solution is the preferred cloud model, while some companies want to move to a more cost-effective public cloud model. With OneCloud, Avaya provides each of these options. 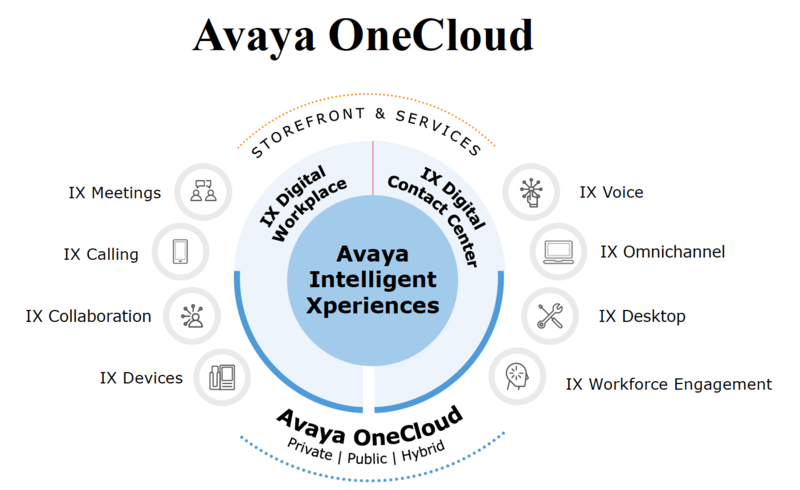 Avaya was a bit late to the multitenant public cloud party, especially on the UCaaS side (the UCaaS service won’t be available until sometime in Q2 or 3) but has still seen a great deal of cloud growth based on its “Powered By,” Avaya Aura UCaaS, and other cloud options. As part of the OneCloud solutions, Avaya introduced a new private cloud offering called ReadyNow. ReadyNow is fully automated and bundled, with reference architectures making it possible to be deployed in weeks or days with a full UC and contact center infrastructure (contact center capabilities will be available in the near future). Based on the full Aura stack, ReadyNow runs in existing Avaya data centers in the U.S., Germany, and Singapore, serving 34 countries. The key differentiator seems to be the 8-12 reference architectures for things like basic voice, advanced voice, team collaboration, etc., enabling customers to get a proof of concept going in a few days. Gaurav Passi, President of Avaya Cloud Business Group, introduced the new Avaya Storefront, for “simple online purchase and fulfillment,” enabling SMB and midmarket customers (through agents and Master Agents) to purchase UCaaS and CCaaS packages quickly and easily on the Avaya website. The UCaaS Essential package starts at $19.95 Per User/Per Month, the Business package adds a mobile and softphone client, as well as call recording and a few additional capabilities and starts at $24.95, and the Power package adds Direct Video Calling as well as integration with Salesforce, Google, and Skype for Business and starts at $34.95. All plans include a free Avaya Spaces User Account. On the contact center side, Basic package starts at $109, per Agent/per Month, while the Advanced package adds screen capture, quality management and coaching abilities and starts at $129 per agent/per month. According to Passi, Avaya is differentiating itself from competitors by being the only vendor that offers both UCaaS and CCaaS in a simple online storefront (I’ve tried validating this and so far haven’t found a similar storefront that lets users purchase both UCaaS and CCaaS online without going through a sales rep). In this video interview, Paul Stephenson, Cloud Chief Technologist, discusses OneCloud and Avaya’s various cloud offerings, as well as the Avaya Storefront. Passi, Stephenson, and others have their work cut out for them, as Avaya’s goal is to grow its cloud revenues from $300 million in 2018 to $800 million in by 2021. Contact center took central stage at the ENGAGE event, and I spoke with Paul Lang, Senior Director of CC Product Marketing about what’s new, as well as Avaya’s partnerships with Verint for cloud-based workforce optimization service, and Afiniti for “enterprise pairing,” which uses AI to predict caller behavior and pair agents and callers. Paul also discusses the Avaya Mobile Experience (now Avaya IX Mobility) and how customers are benefiting from this new service (note: we heard about this capability at last year’s event and were disappointed to hear that it’s not further along, although Avaya did announce both Fatpipe and ACS Technologies are using the service). Throughout the event we heard speaker after speaker tout Avaya’s large and loyal customer base as a key strength that will help Avaya grow and thrive. Avaya has a great opportunity to move these customers to the cloud, especially as many larger customers prefer a gradual migration and generally opt for private or hybrid cloud services. 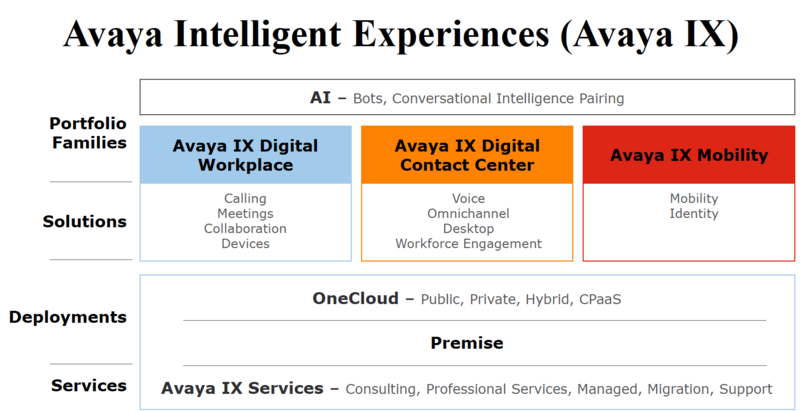 Avaya’s cloud story is still is little muddy, and there are some holes that need to be filled on the multitenant side. Fortunately for Avaya, most of its customers are more interested in private cloud and hybrid services. The Spoken acquisition was intended to give Avaya a fast route to multitenant cloud services, but as often happens with acquisitions, things took a bit longer than expected to get off the ground. There’s a lot of activity going on in Avaya – a new management team (many of whom are former Avayans who were impressed with Chirico and his vision and have returned to the fold), new go-to-market, new innovation centers, and more. I expect to see several strategic acquisitions in the coming months and years, most likely in the areas of cloud, AI, and analytics. While at last year’s event Avaya seemed to be on the defense a bit, this year the company came out swinging and taking on the changes and challenges of the industry. As Chirico stated in his opening remarks, "Change is inevitable. It's all about disrupting the status quo,” adding, “The days of linear change are gone; now there’s exponential change based on how fast and how far technology is advancing. We’re on the verge of a new era with endless opportunities.” Hopefully it will be an interesting and exciting era.